The other day, I had to uninstall Sogou’s browser, which unfortunately came with my favorite pinyin input editor (remind me to tell you guys about it one day), despite me not wanting it. The de-install messages were so adorable, I took a few screenshots to show you! Sogou’s emotional attempt to keep you from uninstalling their browser. wǒ shì xiǎo sōu, wǒmen bùnéng zuò péngyǒule ma? I’m Xiao Sou, can’t we be friends? So, do you believe in second chances or not? If you hover over the 算了吧 button, you then get this picture of Xiao sou bawling. Oh no he’s crying! Does that pull at your heartstrings? Sorry (to hear that? ), and thanks for “accompanying me”! Notice that little heart he’s sending you? Boy, is he relieved. xièxiè nín, wǒ huì biàn de ràng nín gèng mǎnyì! Thank you, I will become more satisfying! 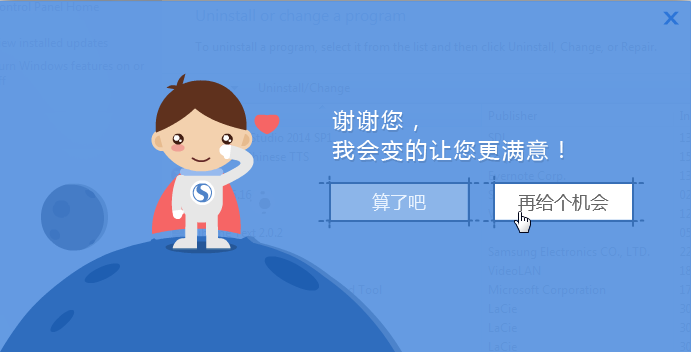 Who knew uninstalling a browser was such an emotional affair! I still uninstalled the browser. How about you? Would you have been swayed by this cute little guy? Ninchanese combines addictive game mechanics, cute cats and efficient Chinese learning techniques to make learning Chinesea blast! The app is now in beta so sign up now for early access to the beta! Check out our trailer and stay in touch with us on Facebook, Twitter, Google + and Weibo.